An investigation by Combined Forces Special Enforcement Unit has highlighted a disturbing trend involving the conversion of legal starter pistols into fully functioning firearms. 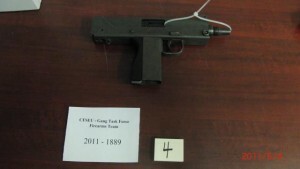 On February 25, 2011, members of CFSEU’s Gang Task Force executed search warrants at Westley Military Surplus on Front Street in New Westminster and at a residence in the 3700-block of Victoria Drive in Port Coquitlam. This five-month investigation began when officers learned that the proprietor of Westley Military Surplus was allegedly selling ammunition to individuals not in possession of a firearms licence as required by law. During the investigation, it was also discovered that this retail outlet was selling starter pistols and starter replica machine guns, and that certain store patrons were allegedly being counselled on how to convert them into firearms. While troubling for police, these guns in their original form are not unlawful in Canada, but the conversion of them into fully functioning firearms is illegal. Westley’s Military Surplus is not a licenced firearms retailer but is licenced to sell ammunition. â€‹Converted pistols and machine guns are extremely unsafe, and are now surfacing on city streets across Canada. Three converted weapons– one resembling a machine gun – were recently seized in Metro Vancouver and on Vancouver Island. While the vast majority of military surplus stores conduct their business lawfully, officers have noticed a heightened interest from some retailers in selling these particular brands of starter pistols. The mounting interest surrounding these pistols concerns the police. Westley William Baker, 67, is charged with four counts of unauthorized transfer of ammunition and one count each of unauthorized transfer of a firearm and manufacturing a firearm. Additional charges are pending. CFSEU’s Gang Task Force gratefully acknowledges the support of the National Weapons Enforcement Support Team as well as the New Westminster Police Service.